*This review contains spoilers for White Cat. If you loved White Cat, you will love Red Glove just as much, if not more. Cassel's adventures continue and his choices become harder and have more consequences. The plot of Red Glove revolves around two big questions: What kind of person is Cassel? What kind of person should he become? Through all the plot twists and turns, Cassel's decisions rest upon these questions. Cassel is more likeable in Red Glove. He came across as arrogant and stand-offish for much of White Cat. The reasons were understandable, of course. He thought he had killed his best friend, and he felt inferior being the only non-Worker in his powerful family. Now Cassel knows that he is an incredibly powerful Worker, has done terrible things, and has been betrayed by his family. You'd think this would make him harder to like and relate to, but the opposite is true. He doesn't need to compensate for his feelings of inferiority anymore. While he can't trust his family, he has a group of friends he can trust. Cassel is going through the same journey of self-discovery as all teenagers, but the stakes are much higher for him. He needs to decide now whether he will join the Zacharov mob, whether he will help or hurt his family, or whether he will help the government. Each of his choices will have consequences good and bad. I love how Cassel slowly transforms into someone who needs nobody to someone who relies upon his friends Sam and Daneca. Both are great characters - resourceful, dependable, and passionate about their own interests. Daneca especially surprised me. Lila is an important character. Cassel's mother made Lila fall in love with him at the end of White Cat and now she won't leave him alone. As much as Cassel is in love with her, he tries as hard as he can to resist. He just can't bring himself to use a girl who only loves him on false pretenses (or does she?). His refusal to use Lila is an indication of Cassel's innate goodness and something that further separates him from his mother and brothers, who would stop at nothing to get what they want. While my review of Red Glove is more of a character study of Cassel, the book really is plot heavy. Cassel goes from one dangerous situation to another. I loved seeing how he used his charm, sarcasm, resourcefulness, and cunning to get out of each one. The book ends at a great point. It resolves the story, but still leaves you wanting more. I really enjoyed White Cat and have read nothing but good reviews for Red Glove, so I'll certainly be picking it up when I get the chance. Thanks for the review! I enjoyed your review, I haven't read White Cat yet, but I am definitely going to check out this series now. Loved this book! I love this author! All of her books are unique and amazing! Great review! I loved "White Cat" for the same reason because of the complex characters. I have this one in my library bag and need to get to it soon! great review and totally want to read this book. Okay I skimmed because I just bought White Cat and can't wait to start it. I wanted to see if you thought book 2 was as good as I've heard book 1 is, and it seems that is the case. Looking forward to reading both of these! Thanks for sharing your great review and I'm glad you finally got to read "Red Glove". I have "White Cat" on my TBR pile! Great review. I love White Cat and I can't wait to read Red Glove. There's also a story online about Lila,but I can't find the link for it. 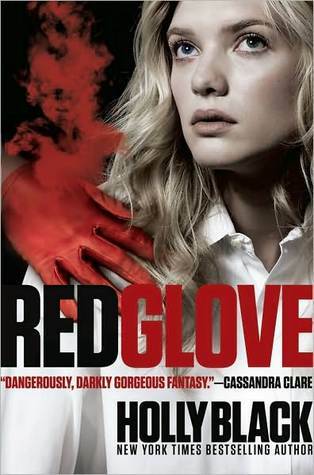 I LOVED White Cat, so I can't wait to read Red Glove. I've got it sitting right here! I just have a few other books I need to get to first. I don't mind that your review is a character study of Cassel, I love him:D He's one of my favourite male narrators. Holly Black invented a really cool world and I am already looking forward to Black Heart. Great review!